MARIETTA, Ga., Aug. 31, 2017 /PRNewswire/ — MiMedx Group, Inc. (NASDAQ: MDXG), the leading biopharmaceutical company developing and marketing regenerative and therapeutic biologics utilizing human placental tissue allografts with patent-protected processes for multiple sectors of healthcare, announced today that their latest peer-reviewed clinical study of the MiMedx dehydrated human amnion/chorion membrane (“dHACM”) allografts was accepted for publication in the International Wound Journal. The paper entitled “A Multicenter Randomized Controlled Trial Evaluating the Efficacy of Dehydrated Human Amnion/Chorion Membrane (EpiFix) Allograft for the Treatment of Venous Leg Ulcers,” was authored by Christian Bianchi, MD, FACS; Shawn Cazzell, DPM, FACFAS; Dean Vayser, DPM, FACFAS; Alexander M. Reyzelman, DPM, FACFAS; Hasan Doslouglu, MD, FACS; Gregory Tovmassian, DPM; and the EpiFix VLU Study Group of Delores Farrer, DPM, MBA, CWS; Elisa Taffe, MD; Lacey Loveland, DPM; David O’Connor, MD; Marc D. Baer, DPM, FACFAS; and Sara Dahle, DPM, MPH. The electronic publication of the article in the International Wound Journal is expected to be made in the next few weeks. At that time, MiMedx expects to issue a follow-up press release with the detailed study results and link to the article. “While we have achieved Medicare reimbursement coverage for both VLU’s and Diabetic Foot Ulcers (DFUs), our breadth of reimbursement coverage with commercial payers is primarily for DFUs. Commercial health insurance plans are heavily influenced by the results of published clinical studies, and numerous clinical studies have been conducted and published that confirm the healing effects of EpiFix on DFUs. With the publication of this study and its compelling results in VLU healing rates, we expect a significant revenue opportunity will develop for MiMedx as commercial payers see this body of evidence demonstrating the clinical efficacy of EpiFix in the treatment of VLUs. We have used very conservative parameters to calculate the impact of gaining additional VLU coverage with payers. We estimate with the impact of this study, MiMedx can obtain VLU coverage for approximately 133 million additional commercial lives,” noted Petit. “We are looking forward to soon reporting the full details of this study when the article is electronically published,” concluded Petit. MiMedx® is a biopharmaceutical company developing and marketing regenerative biologics utilizing human placental tissue allografts with patent-protected processes for multiple sectors of healthcare. “Innovations in Regenerative Medicine” is the framework behind our mission to give physicians products and tissues to help the body heal itself. We process the human placental tissue utilizing our proprietary PURION® Process among other processes, to produce safe and effective allografts. MiMedx proprietary processing methodology employs aseptic processing techniques in addition to terminal sterilization. 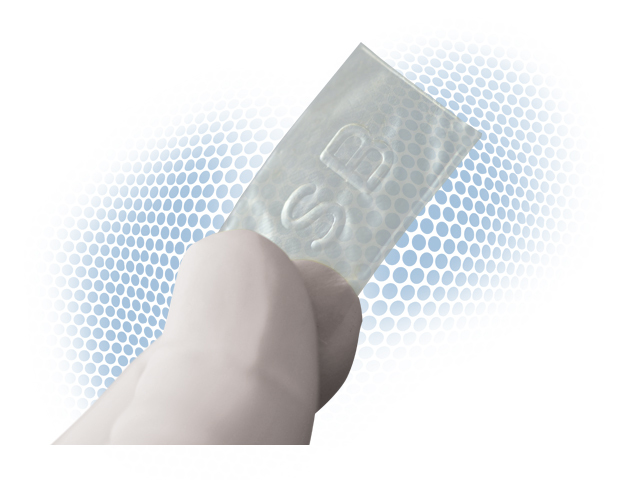 MiMedx is the leading supplier of placental tissue, having supplied over 1,000,000 allografts to date for application in the Wound Care, Burn, Surgical, Orthopedic, Spine, Sports Medicine, Ophthalmic and Dental sectors of healthcare. For additional information, please visit www.mimedx.com. This press release includes forward-looking statements, including statements regarding the timing, results, and publication of clinical studies; the potential safety and efficacy, and additional approved uses and markets for our products; our expectations of how insurers will respond to this data and the size and timing of additional revenue opportunities; the estimated number of sales professionals by year-end; and the advantage over competitors that will be conferred by this result. These statements also may be identified by words such as “believe,” “except,” “may,” “plan,” “potential,” “will” and similar expressions, and are based on our current beliefs and expectations. Forward-looking statements are subject to significant risks and uncertainties, and we caution investors against placing undue reliance on such statements. Actual results may differ materially from those set forth in the forward-looking statements. Among the risks and uncertainties that could cause actual results to differ materially from those indicated by such forward-looking statements include the risk that unexpected concerns may arise from additional data or analysis from our clinical trials; regulatory submissions may take longer or be more difficult to complete than expected; insurance coverage decisions may not occur as anticipated or coverage requirements may change; that regulatory authorities may require additional information or further studies or may fail to approve or may delay approval or grant marketing approval that is different than anticipated; and we may be unable to hire sufficient qualified sales persons in a timely manner. For more detailed information on the risks and uncertainties associated with new product development and commercialization activities, please review the Risk Factors section of our most recent annual report or quarterly report filed with the Securities and Exchange Commission. Any forward-looking statements speak only as of the date of this press release and we assume no obligation to update any forward-looking statement. 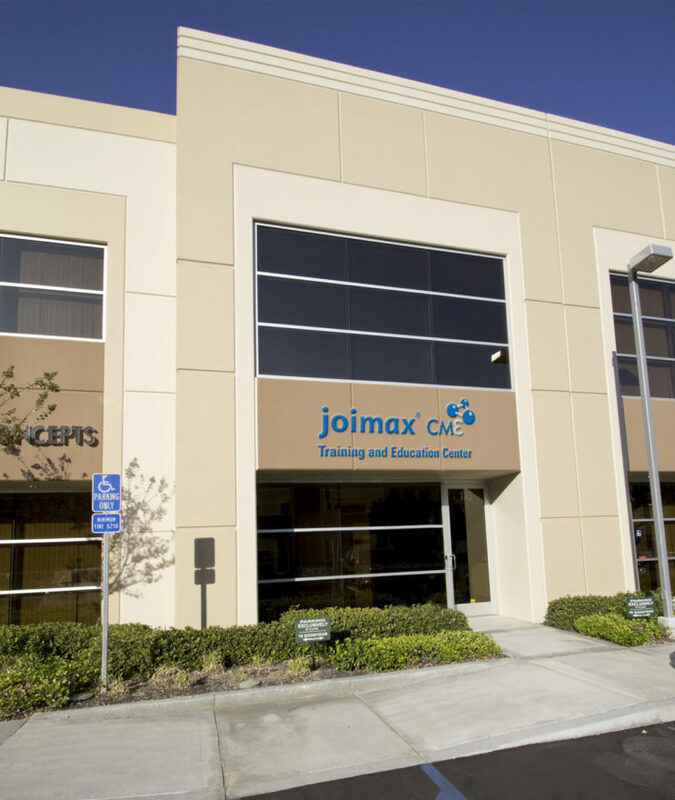 IRVINE, Calif.–(BUSINESS WIRE)–joimax® announces the grand opening of its new state-of-the-art Training and Education Center in Irvine, California. The company will be holding its first workshop at the Center on September 8-9th. As the market leader in endoscopic spine surgery, joimax® is fully dedicated to outstanding physician education, training and services worldwide. Due to the newly released US CPT reimbursement code, valid since January 1st, 2017, the demand for joimax® endoscopic procedures are growing monthly in the USA among patients as well as the physician community. This fast growing demand creates major needs which joimax®, Inc. is addressing with fast expansion of its US organization. “This new wet lab facility provides a major base for supporting our fast growing education needs for both our new sales and clinical associates, but moreover it’s a place for physicians to be trained,” states Bob Wolownik, National Director of Sales for joimax® Inc.
“As we received a first CPT reimbursement code for endoscopic spine surgery earlier this year and now invest wisely for future growth, joimax® will continue to write a major success story in the US, similar to what it has accomplished in Europe and Asia,” states Maximilian Ries, General Manager for joimax®, Inc. He announced that the company is continuing to post record sales by nearly doubling its year to date US revenues, which is in line with the company’s budget plan. Overall joimax® is very pleased with the great strides achieved in the US market and sees continued sustainable growth globally. 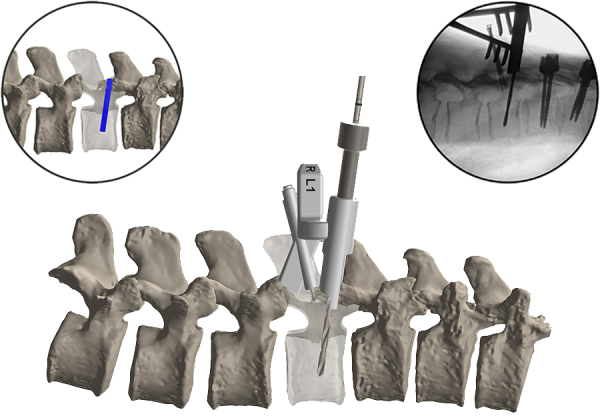 “All this is an important step towards the full acceptance of endoscopic minimally invasive spine surgery techniques and their benefits to both the physician and their patients in the US now as well,” echoes Wolfgang Ries, Founder and CEO of joimax®. The company’s European and Asian sales also show record numbers. Earlier this year, joimax® also received multiple new product registrations in Asia and recently in Brazil to fully access this new market. Founded in Karlsruhe, Germany, in 2001, joimax® is the leading developer and marketer of complete systems for endoscopic minimally invasive spinal surgery. With TESSYS® (transforaminal), iLESSYS® (interlaminar) and CESSYS® (cervical) for decompression procedures, MultiZYTE® (for facet and sacroiliac joint therapy) or with EndoLIF® and Percusys® for minimally-invasive endoscopic assisted stabilizations, proven endoscopic systems are provided that, together, cover a variety of indications. Gosselies, Belgium, 31 August 2017, 7am CEST – BONE THERAPEUTICS (Euronext Brussels and Paris:BOTHE), the bone cell therapy company addressing high unmet medical needs in orthopaedic and bone diseases, today announces the appointment of Jean-Luc Vandebroek as Chief Financial Officer, effective 1 September 2017. Jean-Luc will replace Wim Goemaere, who is leaving the Company to take up a senior position within a not-for-profit organisation. Wim will continue to support the Company as a Non-Executive Director, and will lead a managed succession during the transition period. Jean-Luc Vandebroek is a seasoned finance executive with extensive international finance experience at major public and privately-owned companies. Jean-Luc has built a successful career spanning 15 years at the Belgian-US retailer, Delhaize Group (now Ahold Delhaize). During this period, he held various senior financial positions with increasing responsibility, including roles as Corporate Director Finance Europe and US and Vice President Finance BeLux. He later became Group Chief Financial Officer at Fluxys, a listed, pan-European gas infrastructure group, where he was responsible for the financing of large infrastructure investments using diverse forms of funding on capital markets. Prior to joining Bone Therapeutics, Jean-Luc served as Director and Chief Financial Officer of Moteo Two Wheels and Bihr Europe, the motorcycle division of Alcopa Group, a Belgian family holding with an annual revenue of around EUR 1.7 billion. Our primary clinical focus is ALLOB®, an allogeneic “off-the-shelf” cell therapy product derived from stem cells of healthy donors, which is in Phase II studies for the treatment of delayed-union fractures and spinal fusion. The Company also has an autologous bone cell therapy product, PREOB®, obtained from patient`s own bone marrow and currently in Phase III development for osteonecrosis and non-union fractures. Bone Therapeutics` cell therapy products are manufactured to the highest GMP standards and are protected by a rich IP estate covering nine patent families. 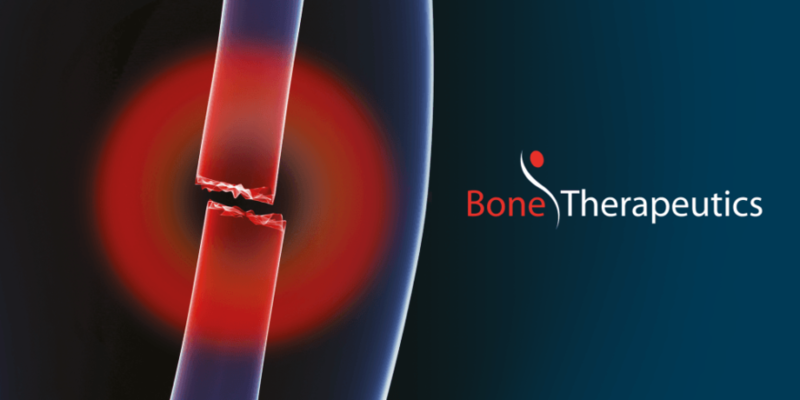 Further information is available at: www.bonetherapeutics.com. DENVER, Aug. 31, 2017 /PRNewswire/ — Fifty-six of Colorado’s top orthopedic physicians, across seven practices, have united under a common vision of improving outcomes, efficiency, cost, and quality to form Orthopedic Centers of Colorado, LLC (OCC). With 19 offices across the Denver metro area, the combined practice is the largest provider of orthopedic and musculoskeletal care in the state. Advanced Orthopedic & Sports Medicine Specialists P.C. In a market where just 33 percent of physicians work in independent practice, down from 48 percent in 2012, this formation represents a physician-driven commitment to the private-practice model of medicine. As a physician-driven organization, OCC will remain nimble enough to adapt to the ever-changing healthcare landscape, and emerge as pioneers in improved patient outcomes and reduced costs, while maintaining strong personal relationships with the patients from the communities we serve. The seven practices will begin operating as Orthopedic Centers of Colorado on September 1, 2017. Patients of the practices will see no interruption in their care and services and will begin to see the OCC name on patient communications. The “Global Cartilage Repair Market 2017-2021” report has been added to Research and Markets’ offering. The global cartilage repair market to grow at a CAGR of 11.59 % during the period 2017-2021. The treatment of articular cartilage has evolved tremendously in the past decade. Reparative and restorative methods have been developed to address the significant source of morbidity in the young and active patients. Articular cartilage injury can be focal, which is localized or systemic. Procedures are being developed not only to alleviate the symptoms associated with articular cartilage defects but also to limit the progression of cartilage damages into degenerative diseases. According to the report, one of the major drivers for this market is Rising incidence of accidental injuries. Globally, the road traffic injuries are increasing, with post complicated symptoms such as weakening of tendons, cartilage tear, and orthopedic issues. The latest trend gaining momentum in the market is Gene therapy and stem cell therapy. Gene therapy is one of the promising fields in the cartilage repair. 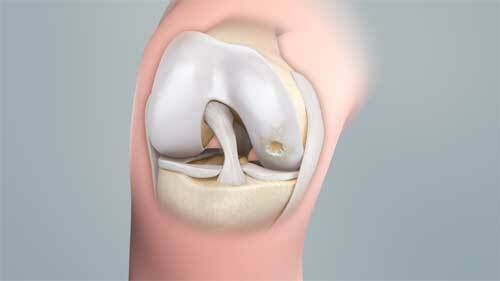 Many clinical studies have been performed for cartilage repair. The researchers are trying to develop gene therapy for cartilage repair and currently been investigated for clinical application. Further, the report states that one of the major factors hindering the growth of this market is Product side effects. Surgeons use cartilage repair products such as tissue scaffold to improve the recovery. These products once grafted in the body may cause serious complications, resulting in their increased scrutiny for safety and efficacy. In many autologous chondrocyte implantation, there were common complications such as graft rejection, symptomatic hypertrophy, disturbed fusion and delamination. Highmark Health and Allegheny Health Network are exploring handheld diagnostic technology that could one day reduce the need for MRI in diagnosing some knee injuries, such as meniscal tears. 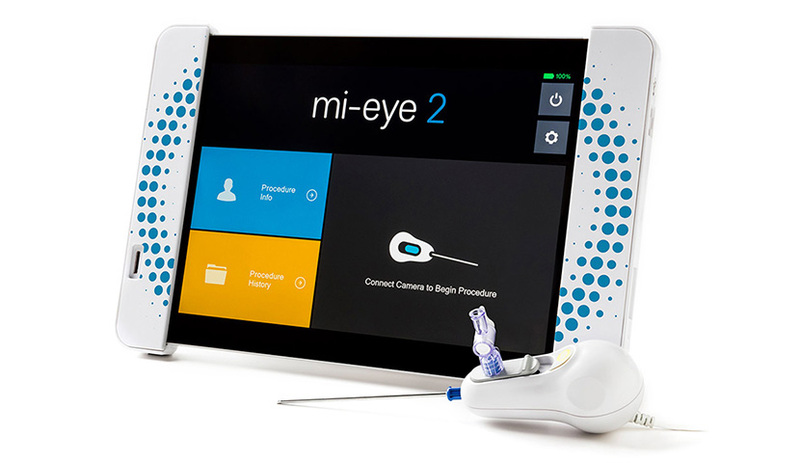 The health care networks on Tuesday announced a collaboration with medical device company Trice Medical to evaluate a new imaging tool called mi-eye, which allows doctors to view knee joints from their offices. The arthroscopic device provides the ability to look inside joints for signs of wear. The study will look at the effectiveness of using the device to diagnose meniscal tears on a patient’s initial visit, possibly saving time and money. Akhavan has enrolled six patients and expects to work with 100 before issuing a final analysis. CAESAREA, Israel–(BUSINESS WIRE)– Mazor Robotics Ltd. (MZOR), a pioneer and a leader in the field of surgical guidance systems, today announced that it has entered the next phase of its strategic partnership with Medtronic earlier than planned and their existing agreements have been amended accordingly. The agreements provide for the conversion of the commercial relationship between the parties, with Medtronic assuming exclusive worldwide distribution of the Mazor X system, and Medtronic making a $40 million third tranche investment in Mazor. These developments are a result of the early achievement of certain sales and marketing milestones by both companies, as well as higher than expected global market acceptance and demand for the Mazor X system. Medtronic and Mazor originally entered into a strategic agreement in May 2016. Medtronic assumes exclusive global spine market commercial responsibility for the Mazor X Surgical Assurance Platform and its accessories. 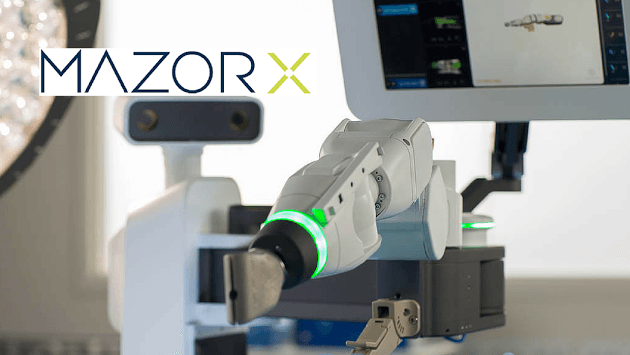 The implementation of annual minimums for purchase of Mazor X systems by Medtronic with a cumulative potential of hundreds of Mazor X systems over a four and a half-year period. Approximately 30 members of the current Mazor sales organization are expected to join Medtronic to assure continuation of the current momentum. Co-development of future products for the spine market that combine Mazor Robotics’ core expertise in surgical planning and precision-guided surgical systems with Medtronic’s navigation capabilities and implant systems. The first results of this combined and synergistic effort are expected to be demonstrated this fall. Mazor will continue to provide service to the global installed base of the Mazor X. A shared economic incentive to continue developing products and services that maintain innovation leadership and utilization of Mazor Robotics clinical solutions. Medtronic will invest $40 million in Mazor Robotics’ American Depository Shares (ADS) at a price of $38.46 per ADS, which represents the weighted average of the closing price of Mazor’s ADS on Nasdaq over the past 20 trading days. This third tranche of investment in Mazor by Medtronic will bring Medtronic’s total investment in Mazor to $72 million, representing approximately 11.9% of the outstanding shares post investment and 10.6% of the fully diluted shares outstanding post investment. Mazor will also issue to Medtronic warrants to purchase an additional 1.21 million Mazor ADSs at an exercise price of $44.23 per ADS. The exercise price represents a 15% premium over the per share price for the $40 million equity investment. Medtronic has the right to exercise the warrants immediately in whole or in part, for cash, and they expire after 18 months. Assuming the full exercise of the warrants, Medtronic’s investment in Mazor will reach $125 million and its ownership could increase to 4.2 million ADSs, or 14.2%, based on the current number of ADSs outstanding on a fully diluted basis. Closing of the $40 million equity investment is expected to take place on or around September 12, 2017. “Medtronic is our valued strategic partner and together we have achieved the desired outcome for Phase I well ahead of our original plan,” commented Ori Hadomi, Chief Executive Officer. 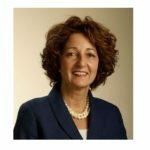 “I believe that the move to this next phase reinforces our significant leadership position in the growing market for surgical guidance systems for spine procedures. Our strategic partnership will allow hospitals in new markets around the world to have access to the Mazor X and gain the clinical benefits that this technology offers. Mazor will continue to manufacture and recognize revenues for Mazor X system sales, disposable kits and service fees all of which will be sold at contractual pricing agreed with Medtronic. The contracted pricing is at a lower rate than Mazor realized through its direct sales channel. In addition, Mazor will be entitled to certain synergy fees associated with the use of Medtronic implants in Mazor Robotics’ installed base. Moving from direct sales to a strategic distribution model is expected to immediately reduce Mazor’s annual operating expenses by approximately $13 million. Trailing 12-month operating expenses for Mazor totaled $52.7 million. The proceeds from the investment will further strengthen Mazor’s balance sheet and provide the resources to continue to collaborate with Medtronic to develop innovative solutions for the spine market, as well as develop innovative solutions for other potential markets. Mazor will continue to independently develop and market globally the Renaissance Surgical Guidance System, which was first launched in 2011. Efforts for Renaissance will be focused on certain market segments for which the Renaissance provides significant customer added value. The Company will host a conference call to discuss today’s announcement at 8:30 AM EDT (3:30 PM IDT). Investors within the United States interested in participating are invited to call 1-800-289-0498. Participants in Israel can use the toll-free dial-in number 1-80-925-8350. All other international participants can use the dial-in number 1-719-325-4818. For all callers, refer to Conference ID 1217133. Mazor Robotics believes in healing through innovation by developing and introducing revolutionary technologies and products aimed at redefining the gold standard of quality care. Mazor Robotics Guidance System enables surgeons to conduct spine and brain procedures in an accurate and secure manner. For more information, please visit www.MazorRobotics.com. This press release contains forward-looking statements within the meaning of the Private Securities Litigation Reform Act of 1995 and other securities laws. Any statements in this release about future expectations, plans or prospects for the Company, including without limitation, statements containing the words “believes,” “anticipates,” “plans,” “expects,” “will” and similar expressions are forward-looking statements. These statements are only predictions based on Mazor’s current expectations and projections about future events. There are important factors that could cause Mazor’s actual results, level of activity, performance or achievements to differ materially from the results, level of activity, performance or achievements expressed or implied by the forward-looking statements. For example, Mazor is using forward-looking statements in this press release when it discusses the outcome of the Phase II agreements with Medtronic, when it states that the results of combined development efforts are expected to be launched this fall, when it states that sales minimums are expected to drive substantial improvement in Mazor’s financial results during the next several years, when it discusses that the strategic partnership will allow hospitals in new markets around the world to have access to the Mazor X and gain the clinical benefits that this technology offers, when benefits spine surgeons will get from the combination of Mazor’s technology and Medtronic’s navigation capabilities and implant systems are discussed, when it discusses advancing its robust, jointly-developed product pipeline for the spine market while pursuing exclusive efforts to apply its innovation to other medical needs, when it discusses that moving from direct sales to a strategic distribution model is expected to immediately reduce its annual operating expenses, when it discusses continuing to independently develop and market globally the Renaissance Surgical Guidance System and where it will focus its efforts with regard to this system, and when it discusses the timing of the closing of the Medtronic purchase of ADSs and the potential exercise of warrants as well as the use of proceeds from the sale of such securities. Those factors include, but are not limited to, the impact of general economic conditions, competitive products, product demand and market acceptance risks, reliance on key strategic alliances, fluctuations in operating results, and other factors indicated in Mazor’s filings with the Securities and Exchange Commission (SEC) including those discussed under the heading “Risk Factors” in Mazor’s annual report on Form 20-F filed with the SEC on May 1, 2017 and in subsequent filings with the SEC. For more details, refer to Mazor’s SEC filings. Mazor undertakes no obligation to update forward-looking statements to reflect subsequent occurring events or circumstances, or to changes in our expectations, except as may be required by law. AUDUBON, Penn., Aug. 29, 2017 (GLOBE NEWSWIRE) — Globus Medical, Inc. (NYSE:GMED), a leading musculoskeletal solutions company, today announced that, the Board of Directors has named David M. Demski as the Company’s Chief Executive Officer, effective immediately. Mr. Demski will report to David C. Paul, the Company’s founder, Chairman of the Board, and Chief Executive Officer since its inception in 2003. Mr. Paul will remain in the role of Executive Chairman. Mr. Demski has been a Globus Medical senior executive since 2003, serving initially as Chief Financial Officer from 2003 until 2008. In 2008, he became President and Chief Operating Officer of the Company, responsible for all of its domestic and international commercial operations, including sales, marketing, manufacturing, and finance. 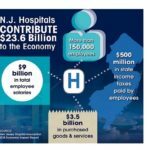 During Mr. Demski’s tenure as President and COO, Globus Medical consistently delivered above-category growth and profit margins, culminating in the Company’s successful initial public offering in 2012. In 2015, Mr. Demski became President, Emerging Technologies, and assumed responsibility for overseeing the Company’s expansion into the areas of imaging, navigation, and robotics, as well as orthopedic trauma, both of which are expected to contribute to the Company’s growth over the next decade. Mr. Paul will continue to focus on strategic initiatives and will spend less time on day-to-day operational matters. The Company reported that the timing of these management changes was designed to allow Mr. Paul to recover from a health condition. Mr. Paul is expected to make a full recovery over the next several months and plans to remain actively involved with the Company both during his recovery and thereafter. “No one is or could be more well suited to be CEO of Globus Medical than Dave,” said David Paul. “He has been with us since the very start of this Company, has led virtually every aspect of its operations, and has been a significant contributor to the Company’s success to date. During the seven years when Dave served as President, among his many responsibilities were direct leadership of both our domestic and international sales forces. During that time, and as he took over responsibility for our Emerging Technologies division, Dave honed a talent for optimizing sales team performance and developing and commercializing new products. His skill set is precisely what we need to continue our focus on profitable growth. For interested parties who do not wish to ask questions, the teleconference will be webcast live and may be accessed through a link on the Globus Medical website at www.globusmedical.com/investors. The call will be archived until Tuesday, September 5, 2017. The audio archive can be accessed by calling 1-855-859-2056 in the U.S. or 1-404-537-3406 from outside the U.S. The passcode for the audio replay is 7826-9364. All statements included in this press release other than statements of historical fact are forward-looking statements and may be identified by their use of words such as “believe,” “may,” “might,” “could,” “will,” “aim,” “estimate,” “continue,” “anticipate,” “intend,” “expect,” “plan” and other similar terms and specifically include statements regarding Mr. Paul’s medical prognosis. These forward-looking statements are based on our current assumptions, expectations and estimates of future events and trends. Forward-looking statements are only predictions and are subject to many risks, uncertainties and other factors that may affect our businesses and operations and could cause actual results to differ materially from those predicted. These risks and uncertainties include, but are not limited to, changes in Mr. Paul’s medical condition, factors affecting our quarterly results, our ability to manage our growth, our ability to sustain our profitability, demand for our products, our ability to compete successfully (including without limitation our ability to convince surgeons to use our products and our ability to attract and retain sales and other personnel), our ability to rapidly develop and introduce new products, our ability to develop and execute on successful business strategies, our ability to successfully integrate the international operations acquired from Alphatec, both in general and on our anticipated timeline, our ability to transition Alphatec’s international customers to Globus Medical products, our ability to realize the expected benefits to our results from the Alphatec acquisition, our ability to comply with laws and regulations that are or may become applicable to our businesses, our ability to safeguard our intellectual property, our success in defending legal proceedings brought against us, trends in the medical device industry, general economic conditions, and other risks. For a discussion of these and other risks, uncertainties and other factors that could affect our results, you should refer to the disclosure contained in our most recent annual report on Form 10-K filed with the Securities and Exchange Commission, including the sections labeled “Risk Factors” and “Cautionary Note Concerning Forward-Looking Statements,” and in our Forms 10-Q, Forms 8-K and other filings with the Securities and Exchange Commission. These documents are available at www.sec.gov. Moreover, we operate in an evolving environment. New risk factors and uncertainties emerge from time to time and it is not possible for us to predict all risk factors and uncertainties, nor can we assess the impact of all factors on our business or the extent to which any factor, or combination of factors, may cause actual results to differ materially from those contained in any forward-looking statements. Given these risks and uncertainties, readers are cautioned not to place undue reliance on any forward-looking statements. Forward-looking statements contained in this press release speak only as of the date of this press release. We undertake no obligation to update any forward-looking statements as a result of new information, events or circumstances or other factors arising or coming to our attention after the date hereof. WARSAW, Ind., Aug. 28, 2017 (GLOBE NEWSWIRE) — OrthoPediatrics and Mighty Oak Medical are pleased to announce a navigation partnership that can provide unsurpassed screw placement accuracy in the pediatric population. Mighty Oak Medical is the manufacturer of FIREFLY® Pedicle Screw Navigation Guides, which are 3D printed and patient-specific at each planned vertebral level. FIREFLY® Guides address the clear market need for a navigation solution that does not rely on intraoperative radiation, and is ideally suited for longer construct cases. OrthoPediatrics regards scoliosis surgeries as an excellent application of FIREFLY® Technology, and has been granted the exclusive distribution rights for FIREFLY® Pedicle Screw Navigation Guides in pediatric hospitals in the United States. The FIREFLY® Pedicle Screw Navigation Guides can be used with any Spinal Deformity Correction system, including the OrthoPediatrics RESPONSE Spinal Deformity System. “This distribution relationship is going to highlight the stark differences between robotic and optical navigation systems, which can cost up to a million dollars and are highly complex and radiation heavy, with the 3D printed patient-specific disposable solution of FIREFLY®. 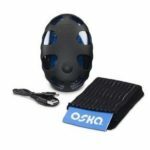 In the capable hands of the OrthoPediatrics team, we believe the FIREFLY Guides’ validated 99.7% accuracy, combined with ease of use, should quickly bring a safe and reliable navigation tool to pediatric facilities across the United States”, stated Heidi Frey, President of Mighty Oak Medical. Founded in 2006, OrthoPediatrics is the only orthopedic company focused exclusively on providing a comprehensive product offering to the pediatric orthopedic market to improve the lives of children with orthopedic conditions. OrthoPediatrics currently markets 21 surgical systems that serve three of the largest categories within the pediatric orthopedic market. This offering spans trauma and deformity, complex spine and ACL reconstruction procedures. OrthoPediatrics’ global sales organization is focused exclusively on pediatric orthopedics and distributes its products to 35 countries outside the United States. Investor Contacts: The Ruth Group, attn: Zack Kubow; (646) 536-7020 zkubow@theruthgroup.com. Mighty Oak is a medical device incubator and a leader in patient-specific solutions for the spine. 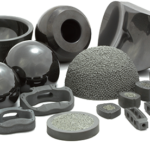 Our robust patent portfolio, both US and worldwide, and pipeline of patient-specific devices for the spine, is unparalleled. By combining the talents of experienced spine surgeons and biomedical engineers, spine surgeries can be made safer and more efficient. Our mission is to improve surgical outcomes in a manner that is both cost-effective and patient-centered. We have the freedom to focus on innovative solutions, and our team is developing many exciting and disruptive products that meet these objectives. For more information, please contact info@mightyoakmedical.com. 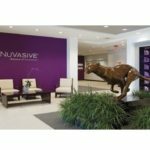 SAN DIEGO, Aug. 29, 2017 /PRNewswire/ — NuVasive, Inc. (NASDAQ: NUVA), a leading medical device company focused on transforming spine surgery with minimally disruptive, procedurally-integrated solutions, today announced the expansion of its San Diego global headquarters, including the creation of an innovation center of excellence where surgeons from around the world will be educated and trained on the latest NuVasive spine technology and procedures designed to drive clinical predictability and improve patients’ lives. NuVasive, founded in 1997 as a local San Diego medical technology startup, pioneered minimally invasive, lateral spine surgery and earned its reputation as one of the most innovative spine companies in the industry. Today, the Company ranks third in the global spine market and anticipates surpassing the $1 billion revenue mark at the end of this year. As the Company continues to grow at an accelerated rate, it plans to renovate and further build out its world headquarters starting in January 2018. The Company’s growth is reflected in several areas, including training more than 500 surgeons annually on its products and procedures at its San Diego campus, a commitment to increasing its R&D spend as a percent of revenue from 5 to 7 percent over the next several years, and creating jobs, locally and globally. a new amenities building which will include an onsite café, fitness center and meeting space to accommodate up to 750 attendees. NuVasive worked closely with city and state officials to re-invest in the area and continue the commitment of bringing surgeons from around the world to train at the onsite cadaver lab. 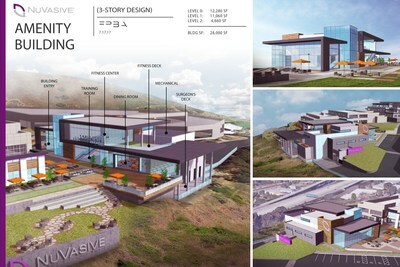 While San Diego serves as the Company’s global headquarters, NuVasive remains committed to expanding its global footprint. The Company recently opened its new international headquarters in Amsterdam, and finished a new 180,000 square foot manufacturing center in West Carrollton, Ohio. NuVasive’s footprint also includes a 100,000 square foot facility in Memphis, Tennessee, which serves at the Company’s central distribution hub. NuVasive cautions you that statements included in this news release that are not a description of historical facts are forward-looking statements that involve risks, uncertainties, assumptions and other factors which, if they do not materialize or prove correct, could cause NuVasive’s results to differ materially from historical results or those expressed or implied by such forward-looking statements. The potential risks and uncertainties which contribute to the uncertain nature of these statements include, among others, risks associated with acceptance of the Company’s surgical products and procedures by spine surgeons, development and acceptance of new products or product enhancements, clinical and statistical verification of the benefits achieved via the use of NuVasive’s products (including the iGA™ platform), the Company’s ability to effectually manage inventory as it continues to release new products, its ability to recruit and retain management and key personnel, and the other risks and uncertainties described in NuVasive’s news releases and periodic filings with the Securities and Exchange Commission. NuVasive’s public filings with the Securities and Exchange Commission are available at www.sec.gov. NuVasive assumes no obligation to update any forward-looking statement to reflect events or circumstances arising after the date on which it was made.